The need to reduce the overall cost of production remains the number one objective within the pig industry with the feed cost having the biggest impact. 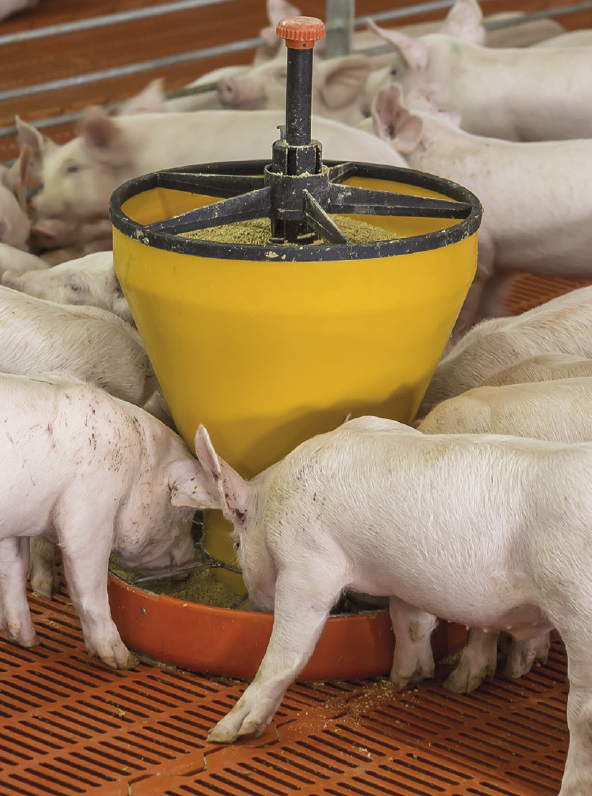 The unpredictable and high variability of raw material costs (cereals, proteins and fats) and the ever growing and more complex load of toxins contamination continue to have a negative impact on pig productivity. As genetic improvements continue in the breeding stock the nutritionist’s challenge is to formulate the correct balance of nutrients throughout the life stages to ensure the increased genetic potential is expressed in terms of ADG, FC and prolificacy. Constraints on feed intake -especially in the case of piglets and lactating sows- remain an important focus in improving overall financial profitability for a producer. Besides production, performance is negatively affected by intensive production stresses leading to disease problems, immunological disorders and gut flora imbalances. Modern pig production has been utilizing antibiotics as a tool in keeping these issues under control for decades. Bacteria naturally develop resistance to antibiotics, and there is evidence that global levels of resistance are increasing. Potentially, any use of antibiotics can eventually affect the efficacy of health management. For this reason, additives such as AGPs, medicated premixes and zinc oxide are no longer available and the use of alternative additives is required. These challenges require research organizations, feed and additive manufacturers and pig producers to constantly strive for more efficient and novel ways to overcome the problems faced while at the same time reducing the overall cost of production to ensure a cost competitive final product. With the aim of assisting the pig producer to meet this broad spectrum of challenges, Innovad has developed a range of products and programs to improve production performance in a number of key areas: improving gut integrity, combatting disease pressures, providing alternative ways to lower or eliminate medicated premixes, stimulating immunity, improving intake, improving growth rates and feed conversion. Piglets are born deficient of energy, but at the same time with a very high demand for energy for thermoregulation and physical activity. The risk of developing post-weaning diarrhea (PWD) is high and causes serious economic losses in pig herds. Piglet diarrhea is managed with systemic injection of antibiotics. However, both legislation and bacterial resistance discourage the use of antibiotics and antibiotic growth promoters. Time, inputs and quality are the main elements of pork production. Goals are to produce efficiently (optimal economic input) and to maximize the quality of pork. It is understood that reduction of health interventions such as antibiotics is feasible if productivity and welfare of animals are also taken care of. Producers strive for their sows to be healthy, fertile and have a good milk yield. A sow’s gut microflora profile has a big influence on its piglet’s gut health. By promoting the growth of beneficial bacteria in the sow’s gut, we can produce a farrowing pen with a desirable micro oral environment ready for piglets.